Rent at the end of the road with less crowds. Choose from six pools and 10 hot tubs. Jimmy Buffett plays on the speakers and the good times keep coming. Come for the breakfast buffet and lunch over the ocean. Spacious living and dining rooms come with extra legroom. Kids will love a few hours at the video game arcade. You're right on the beach and a quick walk to Apache Pier. It weaves indoors, and then flows out around a bend that overlooks the Atlantic. With six pools, 10 hot tubs, and two lazy rivers, there's something fun for all ages. Grab a slice at the seaside Pizzeria or a drink at the pool bar. Sea Watch Resort is located in Myrtle Beach, far enough away from the area’s attractions to enjoy some peace & quiet but close enough to experience the best of what Myrtle Beach has to offer. This beachfront resort has a gated entrance with 24/7 security to give your family peace of mind. After dropping your luggage off in your condo, get changed into swimsuits, grab water wings and goggles, and remember that there’s no such thing as too much sunscreen. Take your pick of the 6 oceanfront pools. Lounge poolside with a refreshing drink from the oceanfront tiki bar while the kids play in the children’s pool or take part in the scheduled children’s activities. During the summer, entertainment is provided by a poolside DJ. There are two 225-foot lazy rivers to choose from. Grab an inner tube and try both before picking a favorite. Hungry? There are 2 On-Site Restaurants, Captain's Cove & Seaside Pizzeria. There’s also a Coffee & Ice Cream Shop On-Site, Captain's Nook, that serves Starbucks coffee, breakfast sandwiches, bagels, cinnamon rolls, ice cream and other snacks. Starbucks coffee for the grown-ups and ice cream for the kids – what more could you want? Studio condos sleep three guests while one-bedroom condos sleep four to six. Upgrade to a deluxe one-bedroom condo for more space and a washer/dryer. Two- and three-bedroom condos sleep six to eight guests. Full kitchens have what you need to whip up everything from hot pockets to four-course meals. Stop by the Walmart Supercenter to stock up on groceries. Take the kids along to make sure no one’s favorites are forgotten. In-suite washer/dryers allow you to save space in your suitcase (more room for souvenirs!) Put your multitasking skills to good use and do a quick load of laundry while you catch a sitcom rerun on the flatscreen TV with cable. Broadway at the Beach is one of Myrtle Beach’s most popular tourist destinations and features a variety of shopping and dining options. Need a new pair of shades? You’re in luck! Broadway at the Beach has three Sunglass Hut locations. Choose an oyster and create your own special piece of jewelry using the pearl at Pick a Pearl. Let each of the kids bring home a toy, doll or stuffed animal from Toys & Co. When it’s time to eat, head to Extreme Pizza, Hard Rock Cafe or Joe’s Crab Shack. 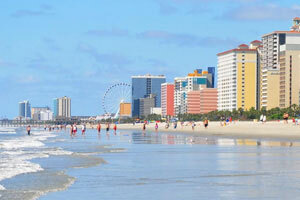 Experience a bird’s eye view of Myrtle Beach with a ride on the SkyWheel. Ripley’s Odditorium features strange and unusual artifacts once owned by Robert Ripley, the creator of the “Believe It or Not” cartoons. - Trailers are not permitted on property from April through the end of September. - There are 6 Seasonally Heated Oceanfront Swimming Pools at the property. Extra person charges may apply depending on hotel policy. One responsible adult, 25 years or older, must be staying in each unit. There are no room charges for children 16 and younger occupying the same room as their parents. Number of occupants staying in a room is restricted to the number of beds and the size of the room.